Note that this weight is almost exactly the same as obtained by assuming the first limitation. As previously explained, the neccssary bolt weight can be decreased somewhat if lubrication is used and some special method can be found by which the allowable average velocity over the first 0.010 second can be increased to more than two feet per second. However, for purposes of continuing the analysis, these special methods will be ignored and the bolt weight will be taken as 500 pounds. Since the total acceleration of the bolt occurs in less than 0.010 second and since the retardation which can be offered during this interval by the driving spring is very small, it may be assumed, when considering the cffcct of the driving spring, that the initial velocity of the bolt is equal to the maximum free recoil velocity expressed by equation 15. It should be noted here that friction between the bolt and its slide will produce an essentially constant retarding force. If it is expected that the force required to overcome the friction will be considerable, this force should be determined and subtracted from the average spring force computed by using equation 1 7. However, for purposes of the present analysis, the friction force will be neglected. Having the average spring force, the remaining problem is to choose spring characteristics such that this average force will result from compressing the spring through the required rccoil distance. The values to be chosen are the initial compression, F„, and the spring rate, K. For example, if the initial compression is taken as 17.2 pounds, a maximum force of 77.2 pounds will produce the required average force of 47.2 pounds. Since the difference between the maximum force and initial compression is 60 pounds and the recoil distance is 10 inches, the spring rate will be 6 pounds per inch or 72 pounds per foot. Any other combination of Fo and K could be chosen, providing that thev produce an average force of 47.2 pounds. 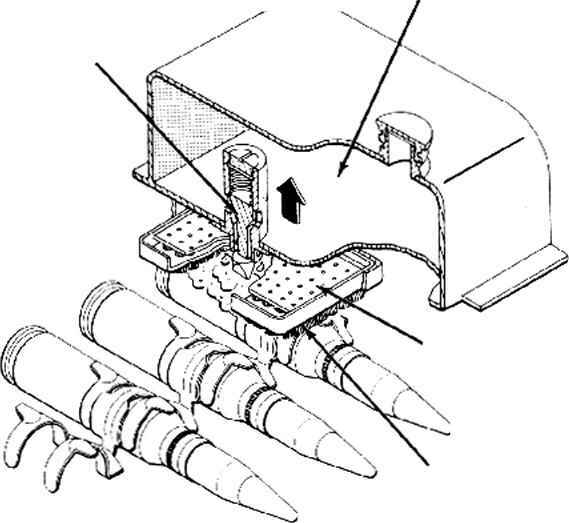 NOTE: Actually, the design of a driving spring for a practical machine gun is a rather complex problem and can not be disposed of so easily. Spring losses, shock loads, forced vibrations set up along the length of the spring, and other factors can cause serious difficulties in operation and may even result in unpredictable breakage. For this reason, the design of springs to be used in a rapidly oscillating mechanism like a machine gun is a specialized art in the field of machine design. Special techniques of analysis are necessary and often a successful design can be arrived at only through careful experimentation. Also, as will be explained later, the choice of Fo and K can have an effect on the rate of fire attainable. Although the factors mentioned in the preceding note should receive due consideration in an actual design problem, it will be assumed here that the arbitrarily selected combination of Fo= 17.2 pounds and K--72 pounds per foot will result in a satisfactory spring. The required bolt weight and the characteristics of the driving spring have now been determined and this determination was made in accordance with the stipulated requirements for limiting the bolt motion and for allowing sufficient recoil travel to permit feeding. In other words, the basic design of the gun is now established and the only task remaining is to consider what performance this design will give. It is obvious that a gun having such a heavy bolt and such a weak driving spring will not be practical. However, the only way to improve the design would be to employ some special method for permitting a higher average bolt velocity. The question of whether or not such a method can be found is not important for the purposes of the present analysis and will therefore be left to the ingenuity of the designer. The main purpose of this analysis is to establish a method of approach to the design of a plain blowback gun and this method can be applied regardless of what particular bolt velocity is allowable.